I'm proud of you. 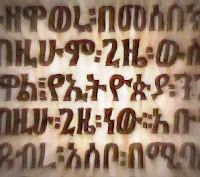 Now a days Ge'ez is not working language in Ethiopia. But, Ethiopian Orthodox Tewahido Church is using it for spiritual services. There are a lot of books in ge'ez, this generation should read. Your activity is very very helpful. Thank you for your professional presentation and structured presentation of Geez. 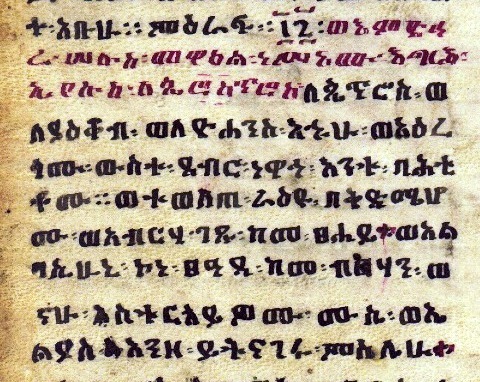 I do speak Amharic and I am an Ethiopian and I listened to Radio Program that teach Geez by Sertse Fresebeat in Ethiopia and I was always looking forward to get such type of printable information to learn geez at my pace and convenience. You really deserve thanks and recognized for your work. I'm trying to discover the name of the Milky Way in ge'ez. I have found two expressions: chaʃara tʃemangadu or pasare zamanegade. Could you please tell me if they are right or wrong? The transliteration is obsolete, I think. Hey, this is yonas. I live in Italy and I am a geez language speaker. Is there something you would like me to help you with? I would like you to show me a way to learn geeze considering me as an eleventh grade school boy and got ambitious to geeze at a speech one has made at a place. Please try to show me the way that I can follow not that I wish I could have followed. Selam Lekulkmu, I thought this Channel (Awde Tinat ZeGeez) is similar to your blog.